Poll: Do you think this would be a good idea? Hey I just found a VIllage that generated on the border of Plains/Savanna. How does everyone think those should work? It's summer in a little more than a month. At least in the northern hemisphere. 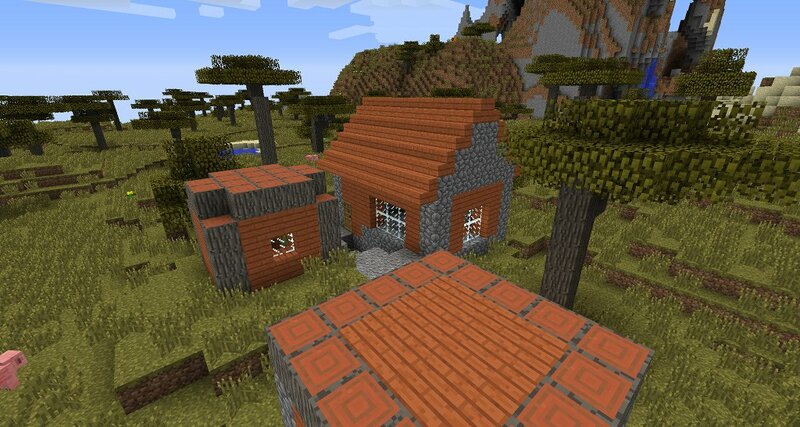 I like this idea, whe have normal villages, and desert villages, why not a savanna village!? Support! Oh man, 2 Golden eggs? WAT IS THAT! And I think that if it's on the border, Savanna should get priority. I think that the acacia would look good in both biomes. Perhaps this color is out of place? Not sure what to think. I sorta like it, but it's just so... orange. You definitely have a point, but i still agree with myself, chameleonred5.I don't think it looks that bad. Maybe it should be the same for spruce biomes. It will have a 50/50 chance of being ether one. I'm very on the fence about this. Is there anything else you could say that would convince me? I think it would blend in really well, especially with the dry grass color. Also, orange is my favorite color! Marshmellow3: If Mojang puts villages there, then I would want that. But they aren't there now. Chameleonred5: I don't really think there is anything else I can say to sway you to supporting it. The only reason I posted this was because it seemed logical to me. All I can think of is its' some nice contrast with the grass. theFURIOUSFOXX...: I agree with that its' a good idea and I am putting it in the poll. VeenM64: Do you support? I think you do but I can't tell. Thanks for defending it, I guess. Okay. Alright, this has my support. I can't think of a reason against it and it doesn't really look bad, even if it seems a little strange to me. Ok thanks Chameleonred5, thanks for supporting. Pizzaeater1373 thanks for thaat I will close the poll now because I did not know there was any ryme or reason to that. Thank you! Oh, VeenM64 i forgot to thank you for your support thanks!